Today’s leading manufacturing and service companies require their suppliers to adhere to strict quality standards. 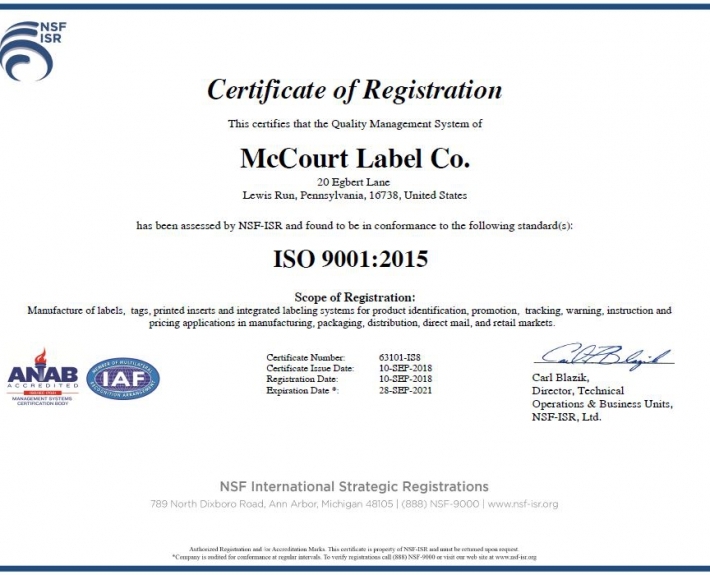 McCourt Label fulfills this requirement through ISO 9001:2015 registration. IS0 9001:2015 is an International Standard of Quality that relies on continuous improvement, leadership commitment, risk management, emphasizing defect prevention and the reduction of variation and waste in the supply chain. The McCourt Label Company will strive to meet or exceed the expectations of our customers, both internal and external, by continuously improving quality, service, delivery and product value through training and involvement of all employees.